Tuesday. 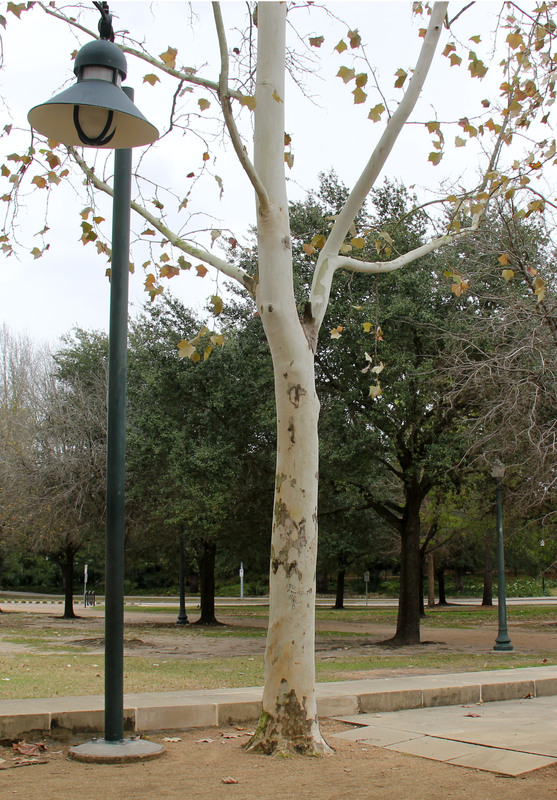 Drove to Hermann Park with Dear Friend (DF). 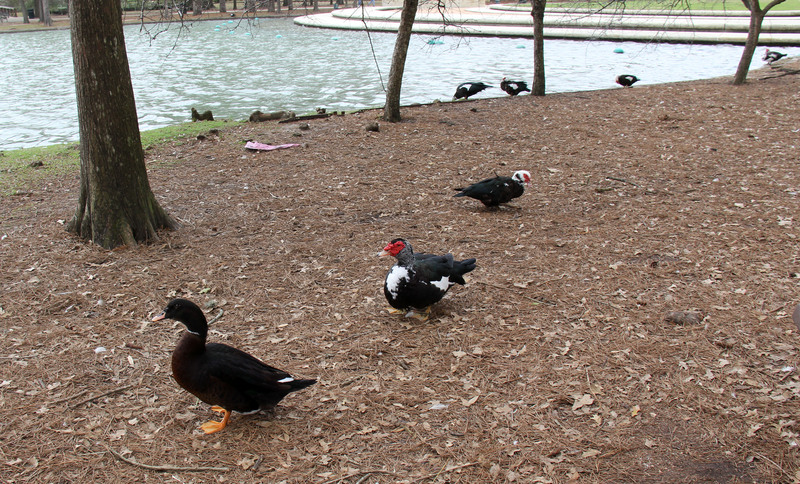 We wanted to spend some time outside on a beautiful cool day with art, squirrels and ducks. This particular park is a wonderful place to go for a walk. There are concrete paths, gravel paths, and lots of grass to walk on. 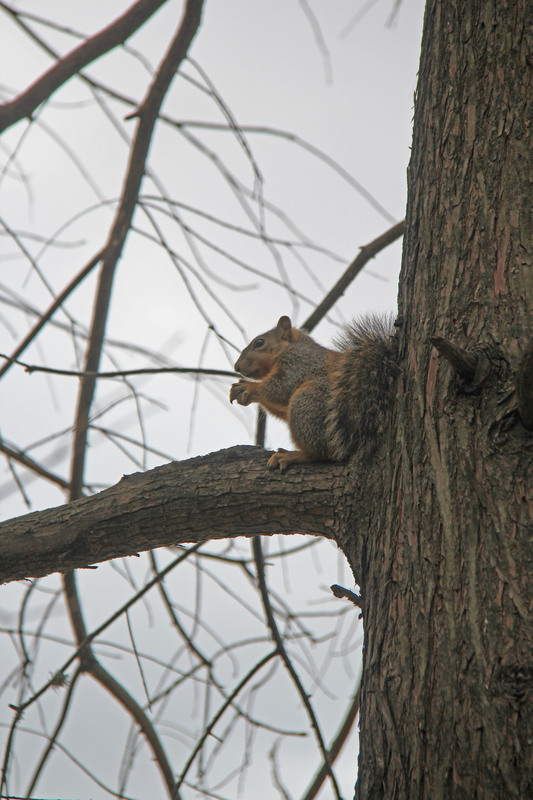 There are also many trees, benches and picnic tables. DF and I walked and sat and walked and sat some more. We absorbed as much of the park as we could and committed it to memory. I took pictures with a real camera (as opposed to the camera on my phone). This particular sculpture was a topic of discussion last year when I took the Women In Art class at the Glassell. The artist who created this piece was sculptor, Hannah Stewart. 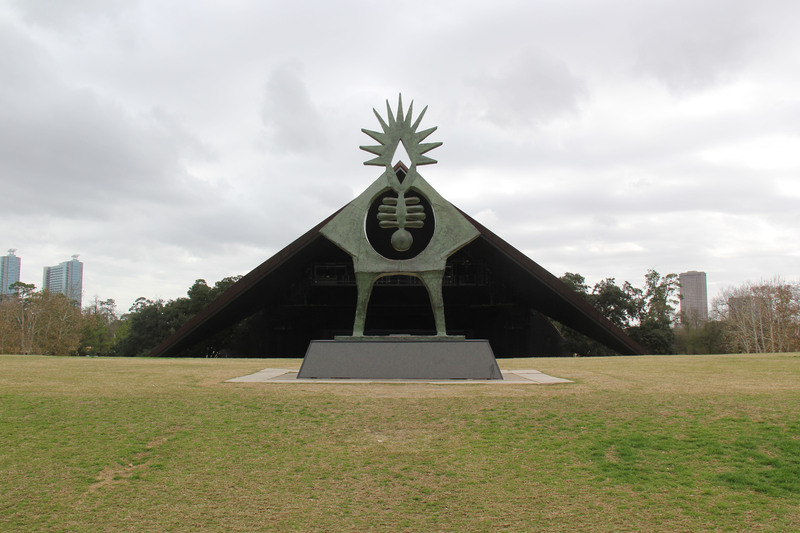 The title of the work is Atropos Key and is located on top of the hill at Miller Theater. Since it was a weekday, there were not too many people. Foot traffic did pick up during the lunch hour with several people escaping an office setting to commune with nature. 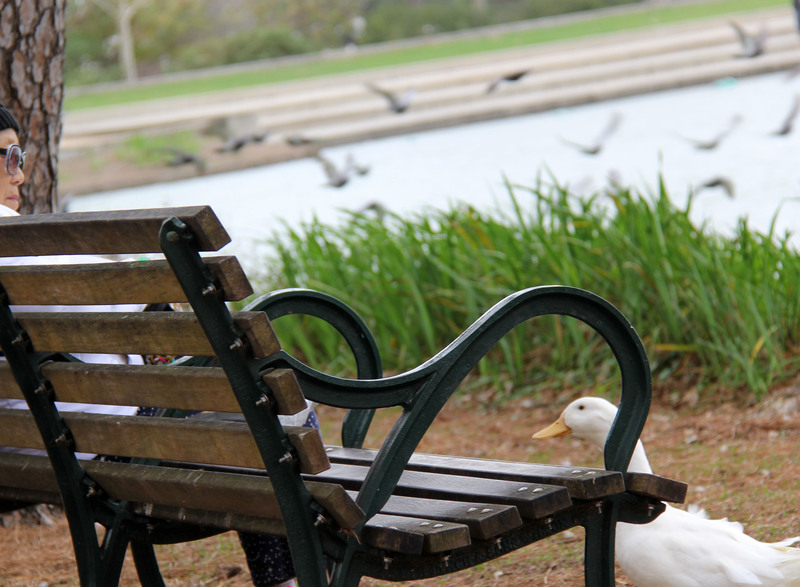 Some folks just walked and others sat on benches and visited with the ducks. Some folks walked alone, some in pairs and others in small groups. 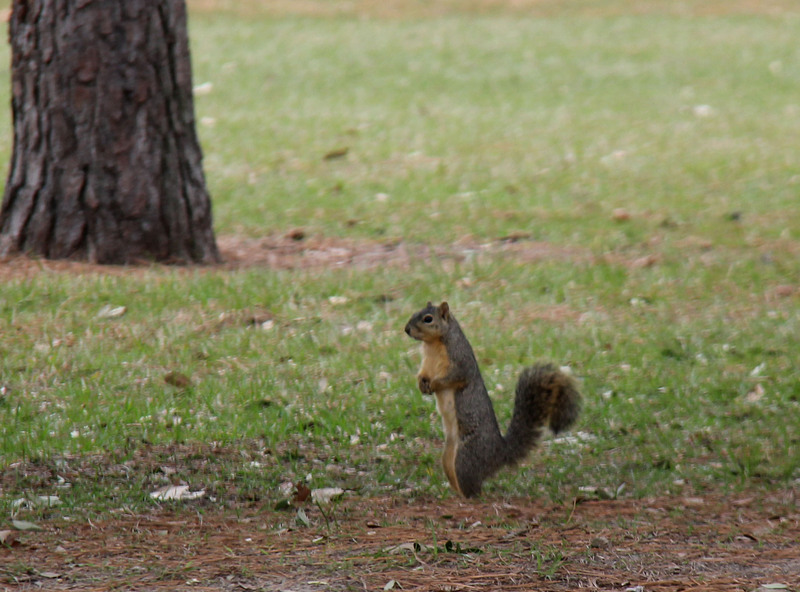 The squirrels kept an eye on everyone who wandered through. Wednesday. DF was in the hospital getting ready for some surgery. Nothing major or life threatening, but necessary. Sometimes a road trip involves being wheeled around a hospital (or accompanying someone who is being wheeled around a hospital). From admitting room, to pre‐op holding room, to operating room, to recovery room, to hospital bedroom. I spent the day either by his bedside or sitting in the waiting room. Surgery was scheduled for 11:30 a.m., but he was not wheeled into the operating room until 1:00 p.m. He pulled through the surgery like a champ. Only a 5 hour wait in the recovery room before DF is moved to a private room. Once I was assured he was comfortable in his room and tucked in for the night, I left with the promise to return the next day to transport him home. Nurses checked on him every hour. Both before and after surgery, we spent time in curtained cubicles where we caught some strange snippets of conversations. Thursday. DF and I had hoped for a hospital discharge by 11:00 a.m. No such luck. There were no more road trips around the hospital. Lots of waiting in the room. The nurse continued to visit every hour. Finally by 3:00 p.m. DF was sitting in a wheelchair on his way to the front door of the hospital. Once out in the sunshine, we drove off in my car. We went to a drug store for meds and then to Brasil’s for an early dinner. I drove slowly through tree lined neighborhoods. Classical music played on the radio. Now life began to return to what can be considered normal.